April 22nd is Earth Day! 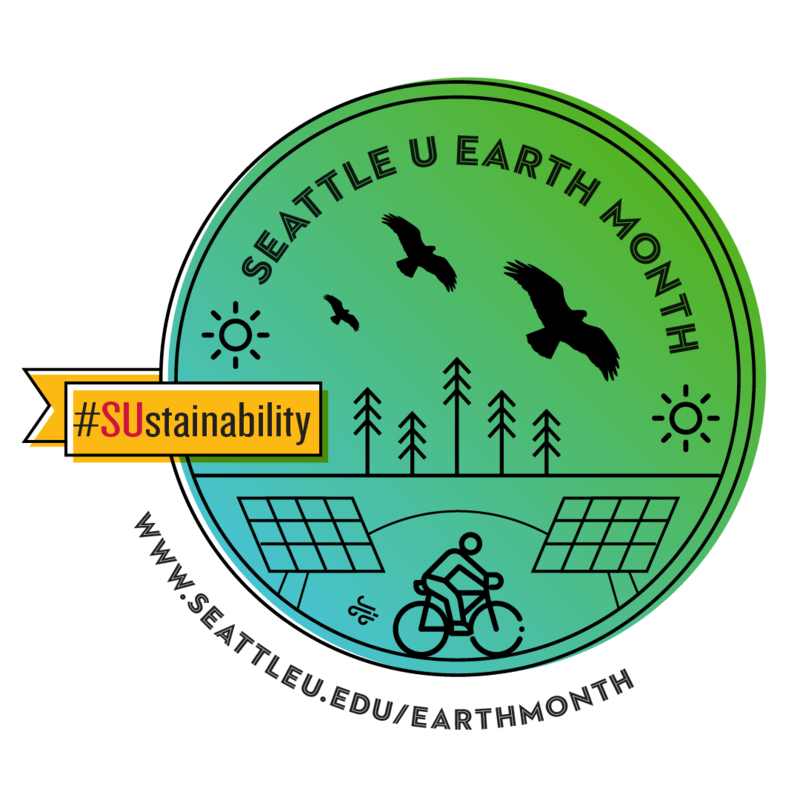 We encourage all SU students, staff, faculty, and alumni to reflect on how we care for the earth and our communities, and to participate in one or more of the many events that are organized at Seattle University this month. What is "Your SUstainability Idea?" Participate in the 2nd annual Earth Day video contest at SU for a chance to win $250! How do I help the Earth? Tell your story in less than 3 minutes and submit your video. Deadline for video submission is April 20th. Any questions? Contact luceroh@seattleu.edu (Indigenous Student Association) and Click here to see the Interfaith Earth Day video contest flyer. All video submissions and the documentary “United by Water” will be presented on April 25 at Wyckoff Auditorium (4:00PM-7:00PM). Check out more event details on ConnectSU here. View last year's video contest winners here! Video prompt: "HOW DO I HELP THE EARTH?" Every weekend in the month of April, Lyft will be providing a discount to students to ride to urban parks in the Seattle area. The discount will only be valid on Lyft's newest Mode, Green Mode. Through Green Mode, all cars are with hybrids or electric vehicles. Additionally, all Lyft rides are carbon offset: since April 2018, Lyft offsets the carbon emissions from all rides globally! The goal of this Earth Month campaign is to help students explore their city while being environmentally friendly. Description: During the month of April, the Library will highlight environmental justice and sustainability related resources. Check out the wealth of books, e-books, streaming media, and online resources in the Earth Month Resource Guide created by the library staff. Also, the Library is one of the locations on campus where you can submit "Your SUstainability Idea" in a suggestion box at one of the i-desks or on the interactive wall design on the 2nd floor. Description: CEJS is participating in St. James' Ecology Fair for Earth Month 2019. Pope Francis’ encyclical Laudato Si’ calls for every person on the planet to show mercy to the Earth, our common home. St. James' annual Fair is an opportunity to become better informed and take action to protect and nurture our environment. Come to the Fair to learn how environmental changes adversely impact those already living on the margins of society and take action to protect the environment by gathering information presented at the Fair! Click here to see the 2019 St. James Ecology Fair flyer. Part of SU's Career Engagement Office's "Inclusion and Industry Takeover"
Description: In this 90-minute interactive Learning Lab, students will explore career track possibilities and learn best practices for landing a social-purpose job. The workshop will take students through a series of real-life case study lessons and hands-on activities that allow participants to roll up their sleeves and apply best practices to their sustainability, equity, and inclusion career search. The presenters from Sustainable Business Consulting have run numerous workshops on this topic and are the authors of Sustainability Jobs: The Complete Guide to Landing Your Dream Green Job. The presenters have advised over 500 individuals through their career search and influenced countless organizations in their pursuit of more equitable supply chains and workplace practices. Description: Join Food With Spirit for an Earth Month Plant Sale. Come pick out plants for the spring season grown by Seattle U students. Bring your own shopping bags! Description: Recycle Your Electronics with Living Green & Support the Special Olympics! On April 23 rd , Living Green Technology will be hosting a fundraising ecycling event at Seattle University in support of the Special Olympics! Do you have electronics you would like to dispose of for free in a safe and environmentally-friendly way? For every 100 pounds of eWaste recycled, Living Green will be donating $25 towards the Special Olympics. Check out the IT event poster by clicking here. Description: Join the Indigenous Student Association and Indigenous People’s Institute at this year's Interfaith Earth Day on April 25! DR Michel and John Sirois from Upper Columbia Unites Tribes (UCUT) will be covering fish passage, cultural responsibility, and the Columbia River Treaty and share up to date information about environmental issues affecting the Columbia River tribes and salmon. Joining John and DR will be Todd Mitchell, Environmental Director for the Swinomish Indian Tribal Community, to share what's impacting his tribe and the salmon and habitat on the coast. Earth Day Video Contest Showcase and Documentary Screening "United by Water"
Description: Join us for an afternoon of Earth Day screenings. The event will kick off with the showing of the documentary "United by Water”, followed by the screening of the Interfaith Earth Day video contestants' submissions. Prize winners will be announced. Light snacks and refreshments will be provided. Any questions? Contact Hannah Lucero at luceroh@seattleu.edu (Indigenous Student Association) and check out the event details on ConnectSU here. Description: April 24 is "STOP FOOD WASTE DAY." How much food do we waste each day at SU? "Weigh our Waste" at C-street and learn about Chartwells efforts to minimize food waste from our cafes, kitchens, and catering. Questions? Email Ashley Keever at ashley.keever@compass-usa.com. Description: Join us for a lunch hour event with Liz Willmott (Microsoft’s Carbon Program Lead), Taylor Graham (Vice President of Business Operations and former Sounders defender 2009-2011), and Dr. Phillip Thompson (Director of Seattle U’s Center for Environmental Justice and Sustainability—CEJS). Microsoft has been carbon neutral since 2012 by utilizing on-site reduction strategies as well as the purchase of carbon offsets. The Seattle Sounders recently announced they will support local habitat restoration projects to offset their annual carbon emissions and become the first team in Major League Soccer to go carbon neutral. How might SU achieve its carbon reduction goals? What type of investments are supported by offset programs and are there any social, educational, and economic co-benefits? Come and ask your questions while enjoying light appetizers offered by Chartwells. This event is organized by SU's President's Committee for Sustainability (PCS). Any questions? Contact Yolanda Cieters at cietersy@seattleu.edu. Click here to view the Achieving Carbon Neutrality event flyer. Tour the "Trees of Seattle University"
Description: Join us for a student-led tour around campus and explore the many noteable trees we have! Can't make the tour? Use this beautiful self-guided map designed by SU alumni Alyssa Lau Trees of Seattle University. Enjoy your walk! Description: Celebrate Arbor Day with SU Professor Le and his class "Psychology and Spirituality" to observe the planting of new trees on Seattle University's campus! All are welcome to help out planting the new trees. This event will support the annual Tree Campus USA designation as a school that promotes healthy trees and student service learning! Contact brittons@seattleu.edu with any questions.